Kandis Residence is a short drive to Sembawang Shopping Centre and Sun Plaza. It is also not far from several schools such as Wellington Primary School, Canberra Primary School and Sembawang Secondary School. Kandis Residence is accessible via Seletar Expressway and Sembawang RoadRoad. Tuan Sing Holdings Limited listed on the Mainboard of the Singapore Stock Exchange in 1973 and was created in 1969 as “Hytex Limited”. It adopted its current name in 1983. Tuan Sing has interest mostly in resort ownership, property investment and property development. Headquartered in Singapore, the Group has over 60 subsidiaries and associates serving a broad spectrum of customers through its work force across the region. Tuan Sing Holdings Limited is primarily an investment holding company with interests in multiple industries, particularly in the areas of property development, property investment and hotels investment. Headquartered in Singapore, the Group has over 60 subsidiaries and a portfolio of residential, commercial and industrial properties in Singapore and China. Close proximity to many Expressways and arterial roads including Central Expressway (CTE), Tampines Expressway (TPE), Seletar Expressway (SLE) and Sembawang Road. 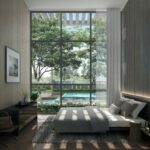 The condo is a short distance to Sembawang MRT station also access easily to Canberra MRT station, the upcoming largest mall in the North Region – North Point City in Yishun Town Centre is within your eay reach as well.